I have posted the recipe for Malaysian/Singaporean style stir fried lo bak goh or commonly known as chai tow kway, here is a similar recipe for Cantonese style with added meat and other ingredients to make it more savoury and flavoursome. 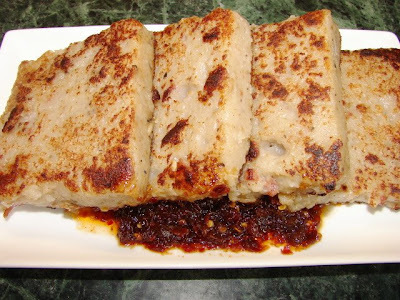 Lo bak goh 蘿蔔糕 is also called turnip cake, daikon cake or radish cake. 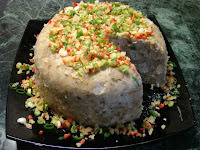 It is a steamed stodgy cake made with rice flour and mooli/daikon. Usually seen or served pan fried in slices. This cake is a Cantonese favourite for Chinese new year and is available in all Cantonese dim sum restaurants all year round. This fried cake in dim sum restaurant normally looks pure white and quite plain with few minute pieces of Chinese sausage etc, the seasoning is usually msg, salt and some sugar. 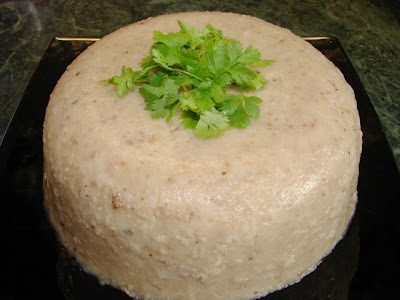 Homemade lo bak goh usually without msg and contains more 料 'lieu' or added ingredients, also the adding of soy sauce can make the cake looks not as white as those in restaurant. Chinese 'wax' meat or preserved meat like lap cheong (sausage) or lap yuk (bacon), minced pork, dried shrimps or dried scallops are common ingredients added for flavour and texture. Here is how I normally make this savoury cake. Soak the lap cheong and lap yuk (if using) in boiling liquid for few minutes till soften then finely chopped. Finely chopped garlic, shallot, soaked mushrooms and dried shrimps. Grate mooli/daikon. I used the food processor grater, saves a lot of work. For a very fine cake texture and save cooking time can also puree the mooli using the food processor. Mix rice flour, starch, sesame oil and stock together. Heat wok with few tbsp oil and fry shallot and garlic till soften. Then add sausage, bacon (or minced pork), dried shrimps, mushroom and scallop (if using). Fry till fragrant, and make sure meat does not clump together then add remaining seasoning ingredients. Remove to one side. Check if the wok has any brown sticky bits, if yes wash before proceeding to next step. Browning bits can make the cake looks greyish or brownish. Stir fry mooli with a little oil for about 2 minutes then add 250ml water and cook for few minutes till the mooli is softened. Stir in flour mixture, taste to check if more seasoning is needed and cook at low heat stirring all the time for till the mixture started to thicken like runny porridge before it gets too thick heat off. Grease a large casserole dish or non loose base aluminium baking tin or 2 - 3 disposable foil oblong/round containers. Pour cake mixture into dish/container, smooth the top with dampen fingers lightly touching the surface. Ready for steaming. For one large cake this will take about 1.5 hour, for a smaller cake about 1 hour. Test with a skewer into the centre to see there is no whitish paste to ensure it is thoroughly cooked through. Once cooked, take the cake out cover loosely and leave to cool. If without a large enough steamer can cook the cake in the oven using a water bath (large roasting tray filled with some boiling water) covered with foil. Can be eaten while warm as it is or cut into slices when cooled and fry with a little oil till both sides are golden brown. It is much easier to slice if the cake is cooled in the fridge for few hours or overnight. Serve the cake with or without frying with Cantonese chilli oil, XO sauce, soy sauce or any favourite chilli sauce. This cake will keep in the fridge for 4 - 5 days or frozen in chunk. If frozen, defrost before frying. Attached is a picture from PlumLeaf who has followed this recipe. She got it wrong using hot stock to mix the dry flour but the cakes did turn out looking good. If you like this type of cake you may also like taro cake. This dish is one of my favourite, but you're right; it's much better home made. I use your recipe and add lots of spring onion. Delicious! i am so blessed to have stumble on your blog. tried this yummy receipe of yours, it turned out to so superdelicious. texture is smooth and velvety and taste wise, was so yummy. you are right to mention that this cake is popular during chinese new year. i remember this dish was served almost in all the household and we, the children then will comment on which aunty's cake was better based on the generousity of the fillings. so, this round, i added slightly more mushrooms and lupcheong and all my boys (4 of them) were fighting over their portion. thanks for sharing this yummy receipe. my next project for this weekend is to try your smoked tea chicken. looking at your picture, i just can't wait for the weekend to come. thanks again. Glad you like it Lori. Personally I like my lo bak goh with less 'lieu' but you can add much as you like. Don't know why, but when I added 300ml stock to the flours (280g rice flour, 50 potato starch) it turned into a dough lump and then there was still dry powder left over! I tipped the lot onto the wok of cooked radish and fried meat bits and added more water. Probably another 600ml! It's still a thick mass, but have scooped out a third and it's steaming away now. Unsure if it'll turn out like a brick. It seems a bit soft when prodded with a wooden chopstick - that would be 'cos I added extra water! Looks and smells nice! Couldn't resist tasting a small teaspoonful either! Tastes good! Albeit a bit soft and gooey! I guess it'll form up a bit on cooling. Now to fill the other foil dishes and steam away! Oh, and let me just add, my radish cake is cooling on the kitchen windowsill with the window slightly ajar - we just had a little cat jump into the house via the window! I guess that savoury goodness attracted it in! When you mix the dry flour with water it should be a thick viscous paste. Then you stir into the cooked mooli and other stuff. If the mooli mixture is very hot, the paste will cook very fast and turn into a very thick gooey lump. So if you are not too sure, just let the hot mixture cool a little first then add the flour mixture. Just follow this approx calculation for any lo bak goh. Anymore the cake can be too soft. I think I can see where I went wrong. The stock was hot - so when this was poured into the flour it thickened to a lump. Not helped by then throwing whole lot into hot wok of ingredients! Well, good job I have two peeled moolis sitting in fridge - I can see myself trying this again! Only whenI sum up energy to do all that fine chopping and slicing of meat bits! Oh no not hot stock to mix the dry flour, that will be a mess. Sorry you got it wrong. Try again. I have amend the recipe so other people will not make the same mistake again. Make life easier, you can roughly cut the 'liu' then blitz in a food processor till fine. I grate the mooli with the food processor too. They look ok now they have cooled and spent night in fridge but will probably be a bit on the soft side! Well we learn by our mistakes! Would you be offended if I posted pictures of the Lo Bak Goh I have made from your recipe on my blog? I will add a link back to your blog as it's your recipe. No don't mind at all. If you send me your photo by email (gmail), I will add this to the post. Lets have fun and learning together. Is it possible to make this without using rice flour? If you use other flour the texture will be different. Can you not get rice flour anywhere near you? You can try plain (all purpose) flour but I am not sure how that will turn out. Hi Sunflower, i can get rice flour but I'm trying to keep this as low carb as possible. I don't know what other flour is low carb. You can reduce the amount of rice flour and water.